Are you looking for Stocks Paying Monthly Dividends? Our In-depth Report Covers 8 Companies Worth over $1 Billion each that pay High Yields of 4% or more. That Means Quality Companies who are Good Dividend Payers. Usually, investors searching for dividend stocks follow an “income strategy” which means they seek to generate a steady income from their investments rather than a big capital gain through appreciation of the stock price. Note: Liberated Stock Trader is in no way affiliated, paid by, or owns any stock in any of the companies mentioned in this report. This is an unbiased research report. In an income investment strategy, WHEN you get paid is almost as important as how much you get paid. Income strategies are usually about creating a cash stream to face specific financial targets. This implies that each investor must build his own portfolio in accordance to their timely needs in a way that dividends are paid WHEN needed. However, some investors have other goals when buying dividend-paying stocks and are actually more interested in reinvesting the dividends received. Even then, dividend frequency plays a big role. The purpose of reinvesting is taking advantage of compounding. In other words, they build a larger position which yields a larger dividend which is reinvested again in making the position even larger. This cycle can grow your returns exponentially and that growth is as fast as the dividends are reinvested. Does this mean dividends paid more frequently are better than those paid less frequently? Like previously mentioned, income strategies can require some management in order to make dividend payments meet specific expenses. It can be difficult to meet recurring expenses with a quarterly or biannual dividend since a lot of those amounts are due on a shorter period basis. Of course, income investors can build a portfolio that pays dividends every month by choosing stocks that reward shareholders in alternate months. Nevertheless, that is more difficult and can be more expensive (transaction costs) than choosing monthly dividend-paying investments. Whether to meet specific financial needs or to take advantage of the compounding, monthly payments can still have the upper hand against less frequent payments. The more frequent the dividend the faster it is reinvested this means your monthly income increases faster. Obviously, the difference is small because each reinvestment amounts to 1/12 of the yearly dividend but over a long period (decades) it turns into a sizeable amount. There is a date after which investors that buy the stock aren’t entitled to receive the next dividend; instead, they have to wait for the following payment. That date is called “ex-dividend date”. Imagine a company that pays an annual dividend of 5%. It’s easy to understand there will be a lot of people trying to get the stock right before ex-dividend date in hopes of getting 5% out of their investment without having to wait the whole year and being exposed to share price volatility. In the same way, there will be a lot of people closing their position after they get their payment. The larger the dividend yield the larger the price swings around the ex-dividend date. When the dividend is spread throughout the year, each payment is smaller which translates into less volatility around these dates. An income investment strategy isn’t intended to be a short-term strategy but every once in a while it’s healthy to reevaluate the portfolio, close some positions and open new ones. When the time comes it can be frustrating having to wait for a dividend that’s distributed once or twice a year. Picture the situation where an investor sells the stock one or two months before the ex-dividend date and the dividend is distributed once a year. This investor might have held the stock for ten or eleven months and he still doesn’t get a cent in dividends. This will happen to a lesser degree to more frequent dividend payments. Some companies mention that there are increased costs for processing dividend payments which makes it more attractive for companies to pay dividends less often. If that’s the case monthly payments can cost roughly 12 times as much as processing a single annual dividend. Could stocks have a higher dividend yield if they paid annual dividends? To pay monthly dividends, a company needs to have a very disciplined financial execution. If its cash flow is exposed to some seasonality the company may require external funds to pay dividends which could otherwise fund itself, provided it had some more time. The business that makes monthly dividend-payments on stocks needs to be very stable – and even then most companies are paying quarterly dividends – it can be a challenge to find the right investments especially if you want to diversify. Why do some Companies Pay Monthly Dividends? From the companies’ perspective it seems unfavorable to pay monthly dividends so why do some companies choose to pay so frequently? If a dividend in itself is a commitment, a monthly dividend is an even bigger commitment, one that attracts investors. Nowadays, companies and funds are more aware than ever of investors’ preferences and do their best to meet them. Also, there are some businesses like Real Estate Investment Trusts (REITs) that receive their income on a monthly basis (e.g. : rents) so it makes sense they also distribute it monthly. Realty Income Corporation has been paying monthly dividends since 1994 and it has increased its dividend almost 100 times in that period. In the last 3 years, its monthly dividend increased by almost 16% which translates to an average annual growth of 5.4%. This is a real estate investment trust (REIT) with over 5,000 rental properties, mostly in the retail space. It is also the largest US company paying monthly dividends. Its financials are very solid with revenue and funds from operations (FFO), which is a big metric of REITs performance, increasing at a steady pace. EPR Properties is also a REIT with over 20 years of track record. It owns an investment portfolio that includes primarily entertainment, recreation and education properties valued at around $6.2 billion. In 2017 it recorded its fourth consecutive year of income growth and revenue jumped 17% from the previous year to $575 million. FFO was also higher recording a 4% increase. EPR did cut its dividend once back in 2008, but it has been increasing the distributions ever since. The dividends have an average annual growth of over 5% and they’ve been paying monthly since 2013. Apple Hospitality’s is one of the largest hospitality REITs in the United States. Its portfolio of assets consists of 239 hotels across 34 states and is valued at $4.9 billion. All of the company’s hotels operate under Marriott or Hilton brands. You can see the dividends haven’t changed since 2015, but that’s when the stock was subject to a reverse stock split which actually triggered a dividend cut. Still, this REIT entered my top 8 for good reasons. At the current price it presents a great yield, revenue is up 19% in 2017, net income rose 26% and FFO 15%. EnLink is a limited partnership primarily focused on providing midstream energy services which include mainly natural gas services and crude oil marketing. It owns pipelines and plant facilities in the United States. What I like about this company is that it has been steadily growing its dividend since the end of 2010 and revenue is exploding. The company just reported second quarter results recording almost 40% revenue growth compared to the second quarter of 2017 and even raised full year guidance for 2018. Not to mention that at current prices it trades at 15 times 2017 earnings. Stag is a REIT that operates industrial properties, most of them distribution/warehouse buildings. Its portfolio comprises 370 properties valued at $2.7 billion. Revenue performance has been flawless over the last few years and FFO just jumped 38% in 2017 compared to 2016 and over 30% in the first half of 2018 compared to the same period last year. Its dividend has been rising every year since 2011 and is distributed monthly since 2013. Main Street Capital is an investment firm that has been distributing monthly dividends since 2008. The great thing about it is that it not only distributes regular dividends which account for the 5.8% dividend yield, it also has a history of distributing special dividends. With these special dividends, annual dividend yield can go around 7.5%. The company just reported second quarter results and net investment income rose 21% following the trend of the last few years. It’s also worth mentioning that the share price performance has been stellar throughout all these years which increments the total return on the investment. LTC was formed in 1992 and it operates mainly long-term healthcare properties like skilled nursing and assisted living facilities. At the end of last year, its portfolio was valued at around $1.6 billion. Since LTC started paying monthly dividends in 2005 distributions were raised 10 times at an average annual rate of 4.8%. Regarding LTC’s financial performance, there aren’t any flashy numbers as FFO is growing at a high single-digit rate and earnings per share were flat last year. The thing is this is a very unique business which brings any portfolio some diversification on top of a very strong dividend track record. Global Net Lease invests in commercial properties and even though it originated in 2011, it only started paying dividends in 2015. Its dividend track record is pretty solid but not that long so you can see the appeal is coming from the dividend yield. At 10% this dividend is pretty tempting, even though total stock return is flat at the moment. Share price took a nosedive earlier this year but it also made a spectacular recovery. Their top line is growing as well as their portfolio, but interest is still taking a toll on profitability. It also brings some diversification because half of its assets are in Europe. These are my favorite monthly dividend-paying stocks. All of them have a market capitalization of over $1 billion and a dividend yield above 4%. Even though operating in different areas the truth is most of them are REITs with a solid dividend track record. With that being said it might be smart to add other monthly dividend-paying assets like bonds or funds for diversification purposes. Learn more about dividend investing and read out expert tips on dividend strategies. 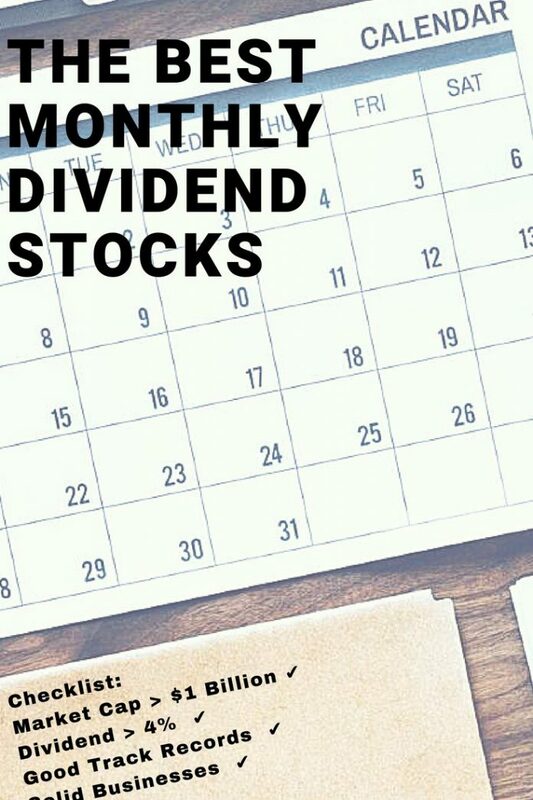 If you are looking for alternative dividend stocks, check out our Best Real Estate Investment Trusts Paying Monthly Dividends, or our Top Monthly Dividend Stocks. If you want the very best dividend income stocks look at our Dividend Emperors report. Our Highest Paying Dividends Special Report is also important reading. Note: We Hold No Positions in any of these stock, nor do we have any business or personal relationship with any of the companies mentioned – this is a completely unbiased report for educational purposes and is not a recommendation to buy or sell any stock referenced. Vasco Ferreira graduated in Business Administration in 2009 and since then has been passionate about stock markets. He’s been investing and writing about it since then. He interned at an investment Bank during his Master in Finance, worked in a major consulting firm and in one of the largest national retail enterprises. Now he fully dedicates his time to personal projects which include writing stock market articles and analysis.